Industrial Ventilation Inc. (IVI) is the industry leader in state-of-the-art ventilation technology and crop storage climate control. IVI specializes in post-harvest, root crop storage climate control and ventilation systems—from development to installation and service. We custom design systems to meet your goals, and back it up with responsive, dedicated service technicians. Having pioneered the development of climate-controlled vegetable storage facilities over 40 years ago, IVI remains the industry leader. Your crops are protected by the most advanced, most trusted systems in the world. IVI anticipates changes and opportunities in agricultural storage, and continually develops and improves systems and support products. 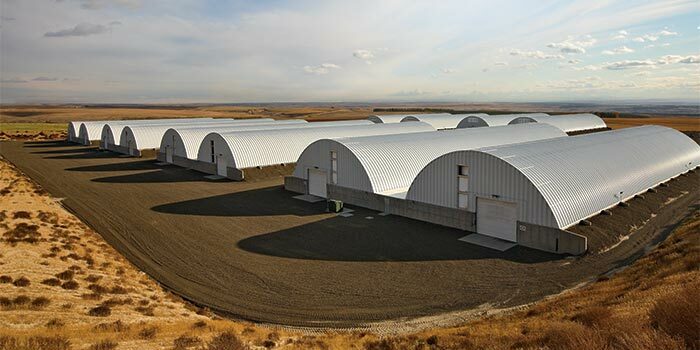 Our goal is to help you maximize crop storage length and quality, resulting in higher profit opportunities and a better end-product for consumers. In the storage business, timing is crucial. As an Industrial Ventilation Inc. customer, when you have a problem, you receive attention—IMMEDIATELY. We dispatch our team of highly trained service technicians, wherever and whenever needed, 24 hours a day, 365 days a year. Our truck inventories are carefully maintained for fast response and quick repairs—resulting in the crucial link between problems and solutions. IVI extends your crop protection with a patented sprout-inhibiting treatment process. We are one of the largest providers of sprout-inhibiting treatments, and our exclusive process has proven itself with some of the largest potato storage operations in the world. In addition, IVI offers OZONE Control for vegetable storage protection. Similarly to our sophisticated food storage facilities, IVI Climate Control Systems are adaptable for commercial structures and facilities in textiles, paper products, and wood working industries. Whatever the need in climate control systems, temperature, humidification, and CO2 levels—we can fill it. Our computerized climate-control systems precisely monitor and regulate all interior environments, and are easy to operate. Simple computer commands alter system operating parameters quickly and easily to maintain peak efficiency. Together with our Industrial Ventilation Inc. systems, Telecommunication modems provide further convenience and remote monitoring. We now also offer an app for iPhone, iPad and Android—for the easiest remote monitoring and control available.